What does it mean when a huge industrial animal factory, with insistence from Australia's largest producer of chicken meat, sue a woman in her 60's and a relatively small animal rights group? It means they have a lot to hide and it means a handful of people have this sickeningly cruel industry very worried. On June 24, 2010. Parkhurst Farms sued both Patty Mark and Animal Liberation Victoria for trespass/damages/exemplary damages/costs in relation to trespass on their broiler chicken factory near Werribee. It is true that Patty and ALV's Openresue team trespassed on this industrial wasteland holding eight massive chicken sheds. Each windowless metal shed belches out 40,000 chicks five times a year, a total of 1.6 million chickens every year who are slaughtered for supermarkets, KFC and other fast food outlets. The chickens are 'owned' by Baiada, Australia's largest producer of chicken meat. Patty and her team trespass (a minor offence) only to help sick and dying individuals they know are being ignored by the industry and all responsible legal authorities. They also photograph and video tape the conditions in a determined effort to get help for the crippled and dying chicks they have to leave behind. Patty and her team had been trying to expose the cruelty at Parkhurst Farms since 2004, things changed dramatically on March 25 this year when ABC Lateline ran a national story featuring ALV's footage taken inside Parkhurst Farms on March 19. It let the Australian public see what the rescue team sees every time we go into those sheds: sick birds, crippled birds, dead and badly decomposing bodies being eaten by the crippled chicks who can't reach food or water. We know these sickly birds will soon be the decomposing bodies being eaten. Yet days later Joe Camilleri was having to defend one of Baiada's 'growers', Parkhurst Farms, by telling ABC Lateline that they audit Parkhurst Farm every fortnight and everything has always been in order. However the footage clearly showed this not to be the case. 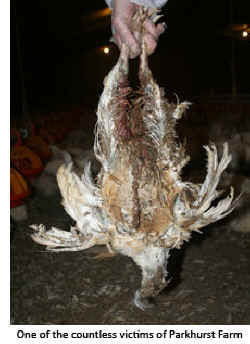 The last thing Baiada wants is the public to see the disgusting conditions inside chicken sheds. ALV were told that Baiada gave orders to Parkhurst Farm to shut Patty Mark and ALV up or they would shut Parkhurst Farms down. Thus the writ for civil trespass was delivered to both Patty and ALV. ALV was fortunate to get the help of PILCH (Public Interest Law Clearing House) who arranged pro bono legal advice and the Barristers Panel for Animal Welfare who also helped on this case. A civil matter is heard in the County Court as opposed to a criminal matter in the Magistrates Court. Trespass is generally a criminal matter and the defendant/s are prosecuted by the Police and are allowed to give evidence in their defence as to why they trespassed. Patty and ALV have been before the Magistrates Court on several occasions and notably at times, after showing their footage, avoided conviction and costs were awarded to the police! But in this instance, being a civil matter, the judge doesn't want to know why (nor is it allowed to even submit evidence) someone trespassed, just that they did, so there was no way Patty or ALV could have properly defended themselves. Expert legal advice told Patty and ALV the ongoing case would cost upwards of $90,000 with no hope of winning and we would not be allowed to show the judge the damning footage of what propelled us to enter this property to save those lives. The court has the power to make one/both parties sell their property to pay costs and damages. We were advised to settle out of court as soon as possible. Words can't describe the torment and stress of the past couple months going through the settlement negotiations. Patty and ALV are now forever prohibited from entering Parkhurst Farms again, if she does, Patty faces loosing her home and ALV faces bankruptcy while Patty and team members would most likely also go to prison. But those little chicks haven't lost us, we fought to get the confidentiality clause deleted from the settlement and thanks to our expert pro bono legal help this succeeded. Parkhurst or Baiada can't stop us from using and displaying the 80 hours of video footage or the thousands of photographs we have compiled over the past six years. And the chicken industry can't stop the growing tide of humans saying NO when they see how horrific and unhealthy the broiler chicken industry is. ALV started investigating Parkhurst Farms in 2004 when Parkhurst were illegally operating before their planning permit was even approved. 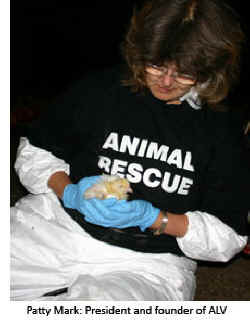 Over the next six years we've carried out 22 rescues, taking hundreds of ill chicks, to a vet for treatment. On one occasion there were so many dead and dying chicks we felt overwhelmed and rang the police for help. Two officers answered our call at 1:00 am and were so distressed at what they saw they helped us carry over 50 of the chicks to the nearby Werribee Vet Clinic. But repeated efforts, year after year, to get the RSPCA, Department of Agriculture and Local Council to take action failed and in effect we were helping Parkhurst Farm clear out the sick and rotting bodies from their sheds, as media declined to show our footage because it was deemed too graphic and would 'upset' their viewers. The broiler chicken industry expects 4% mortality in each shed, which means they know 1,600 of the 40,000 chicks in each shed will be dead before the 6-8 week growing cycle is over. This gives an indication of how horrible the conditions are. All the chicks are routinely given antibiotics in their water which helps keep the rest alive until slaughter weight. 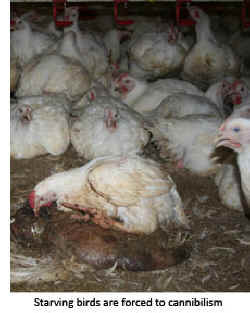 Broiler chicks are often on damp 'litter', the ammonia burns your eyes and throat and the stench makes you gag.